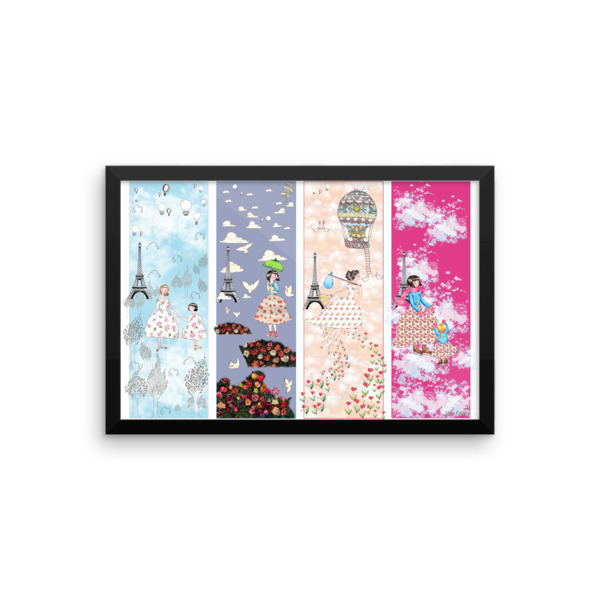 This poster is a four panels fairy tale about Paris. Once upon a time, a little girl secretly dreamed to travel the world. “Paris is the most beautiful city in the world, you don’t need to travel!” would her mother tell her while admiring the beautiful spring roses under the Eiffel Tower. But the little girl was determined, as it was her dearest dream to see the world. She waited to be old enough to leave, until the last days of summer. She grew up, and on a warm autumn afternoon she went on a long journey on a hot air balloon. She saw many countries that were very different from what she knew, and she found love while traveling. After a few years, she became a beautiful woman and had a daughter. She brought her to Paris on one winter day, and she realized that nothing had changed! She had become a mother herself, and she felt that she finally wanted to be back to her hometown. Paris is my hometown, and wherever I live in the world, I am always surprised to notice that nothing ever changes when I come back to Paris. My favorite monument is the Eiffel Tower, I am in love with this architecture, for this reason it often appears in my paintings. This poster would be nice in a child’s room, as it is a life metaphor about growing up. The colors are very soft, with warm tones of pink and blue. This poster is part of a series of fairy tales, “Once upon a time” around the world: check also “Once upon a time in Bali” in Indonesia, and “Once upon a time in Kyoto” in Japan. These three prints were featured in an exhibition in Kyoto, Japan, in march 2015. When they are put together, they look like a rainbow! The original drawing is made with color pencils and nail polish.The print is made using museum-quality Epson matte paper. It will be delivered already in a semi-hardwood black color frame, and will be ready to be hanged on the wall.